In the wake of a disaster, the speed of a response often means the difference between life and death. The Samaritan’s Purse Disaster Assistance Response Team maintains a constant state of readiness so that when disasters strike, we can immediately mobilize to bring life-saving care and supplies to those in need. For more than 10 years, Samaritan’s Purse has envisioned expanding its medical response capacity to include a mobile emergency field hospital, and for the past three years, we have actively been working to make this dream a reality. After the 2010 earthquake in Haiti, Samaritan's Purse realized the need for medical care during disasters. The emergency field hospital first deployed to Ecuador after the earthquake in April 2016. On April 16, 2016, a 7.8-magnitude earthquake struck the northern coast of Ecuador and collapsed a main referral hospital in Chone. Samaritan’s Purse identified a gap in the medical infrastructure that our field hospital could help fill to meet the medical needs of people in need of trauma care. Because we had spent years preparing for a medical response like this, we were able to respond quickly and get the field hospital, medical staff, and relief teams on the ground in Ecuador four days after the earthquake. The set-up team, doctors, nurses, and the Ecuadorian Army pitch in to get the hospital running within 11 hours. Upon arrival in Chone, the set-up crew began to unpack the unit and build the hospital. 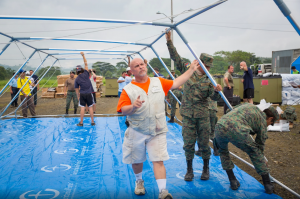 While the team had done mock set-ups of the field hospital for training purposes, this was the first time it was assembled with patients waiting for care. Under the direction of Kenny Adcock, the readiness manager of the hospital, everyone pitched in to help—doctors, nurses, and the Ecuadorian army all worked diligently alongside the set-up team, understanding the dire situation at hand. During the past two months, medical staff treated 1,285 patients and performed 287 surgeries. They treated severe fractures, appendicitis, pressure wounds, third-degree burns, and other serious medical conditions. Did you deploy to Ecuador with Samaritan’s Purse? Sharing your experience will help prepare future disaster response team members! Post your memories, lessons learned, photos, and video in the feed below.